In its second year, UW–Madison’s UniverCity Year program directed 305 students and 16 faculty members across 11 departments to come up with ways to address Dane County’s housing gap, improve economic development, and protect its water quality. On May 4, students, faculty members and the Dane County Board of Supervisors celebrated the year-long UniverCity collaboration. The program works to extend the Wisconsin Idea to the level of the classroom by pairing UW–Madison’s latest research, technology, and brainpower with local government. 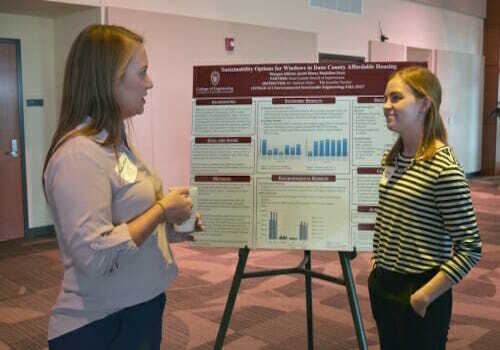 Students and faculty from disparate schools and departments – from Engineering and Environmental Studies to Journalism and Real Estate – filled the Lake Mendota Room of Dejope Residence Hall with poster boards detailing how best to improve their community. In all, 26 projects were completed and presented. Students from a residential real estate development class tackled affordable housing for the Village of DeForest. Senior Austin Jansen, a real estate and finance major, presented the class’ proposal for a Section 42 tax incentive program which would encourage developers to put private investment into the development of 51 units of affordable housing. The class did a detailed survey of the land and its resources, made a trip to the village to select an ideal spot for development, and met with city officials to determine feasibility. He said he’s been using experiential learning to get students working on real world problems for more than two decades. The aspect of UniverCity Year that makes it stand out, though, is that it pulls departments and schools out of their “silos” and lets them collaborate. Last semester he taught a class on urban design that looked at the populations that need affordable housing in Dane County. Each student was asked to create a profile of a typical household in the county. This semester he taught undergraduate classes inlandscape architecture and housing and urban design. The Dane County Board of Supervisors, with its 37 elected supervisors who create policy for the county, offered real-life situations for classes to work on. Sharon Corrigan, Chair of the Dane County Board, said the projects have created buzz among supervisors who are excited by the students’ and faculty members’ plans and geared up to implement them. The issue underpinning all projects was equity, Corrigan said. Even projects that worked to improve the water quality of lakes, for instance, were chosen because the local government wants to ensure everyone can share in the lake equally. UniverCity Year is a program within UniverCity Alliance, a broader effort bridging local government, the people of Wisconsin, and UW together in order to work on public issues. Gavin Luter, UniverCity Alliance’s new director as of April, said UniverCity Year is a realization of the Wisconsin Idea. “This really is the heart of the Wisconsin Idea, to make sure that local government, state government can learn from the expertise on campus,” Luter said. Last year, students, faculty, and officials worked on problems facing the city of Monona. This upcoming year, it’s Green County’s turn. “I’m looking forward to doing some more work next year … that might bring our different skill sets and worldviews and areas of expertise together to really do some powerful stuff,” LaGro said. Green County, located in south central Wisconsin and known for its pastoral scenery, is politically and socially different from Dane County and offers its own unique set of pressing problems, Robbins said. But the UniverCity Year model is flexible, he added, and can move anywhere in the state. UniverCity Alliance is currently recruiting faculty for the coming semester to work on projects like reviving the county’s downtown centers, designing safe transportation routes to school, and launching cooperatives to support farmers. May 4 did not mark the end of the relationship between UniverCity Alliance and Dane County but was merely the beginning of a conversation, Robbins said. In the future, faculty, students, and alumni will still be able to come to the table and hash out solutions to Dane County’s most urgent concerns.